It's been a whirlwind of crazy busy days the last few months, and I'm just now dusting off the ole blog. I was at least keeping up with InstaFriday for a little bit (and am still snapping Instagrams like a crazy person), but those fell to the wayside too. With the holidays approaching, I had been wanting to get back into the swing of blogging regularly, solely because it keeps me grounded. Everyone's busy and have their own life to tend to, but I find major therapy in pounding the keys of my laptop. It's a great outlet...even if no one cares to hear about my ramblings. This post was intended to be an update, but I can't shake that there's more I need to say. I started a new Bible study through my Good Morning Girls group just this week. It's a short 4-week study based on the Advent and focused on Jesus' birth. The study alone has been great so far, but there are weekly family activities included as well, which makes it not just a personal Bible study, but one that can easily be turned into family time. And isn't that what family worship is about? Living life day in and day out focused on Jesus, on grace, and on glorifying Him, even in the mundane. To be honest, I've failed in the family time this week, but weekdays are just an odd routine for us. So I'm looking forward to the weekend to really be able to drive home what I've been absorbing from the Word this week. Today's reading really hit me hard. I've neglected my God time lately and it shows. Actually, it screams out. My patience is shot, joy is minimal, and I feel like I'm trudging through the day. That's no way for a Believer to live. We're called to live and walk and do life with joy! Today's verses actually focused on Old Testament prophecies predicting the birth of Jesus, specifically Jeremiah 33:15-16. My Bible cross-referenced Isaiah 11:1-5, which drove it home even further. When thinking about the Christmas story, the fact that it was foretold many years before it actually occurred is a fact that I sometimes forget. As amazing at the events of that day were, it's moreso amazing when you realize that His coming was specifically prophesied years before...multiple times -- not just by Jeremiah and Isaiah! God had a plan in place -- a perfect plan -- before the foundations of the earth. And every step toward that glorious Bethleham night and every step since that night are for a specific reason; to bring redemption. 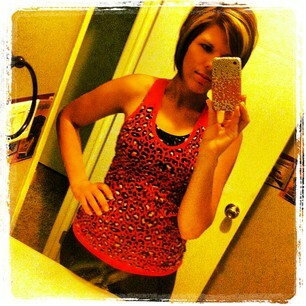 What a beautiful picture of grace! I had to break down and ask forgiveness for my attitude lately...to much impatience and snappiness, not enough gratitude and joy. And we just wrapped up Thanksgiving...seriously. In this study for this week, we're focusing on hope and the joy that we can have because Jesus brought hope to our world with His birth, and every day since. If my heart were truly focused on the miracle and grace that was poured out at Jesus' birth, then my heart can only be overjoyed. Forgive me for losing focus. Help me, today and every day, to not lose sight of the manger because it leads to the cross and is the very definition of redemption. Redemption on an undeserving, messy world. Redemption for my undeserving, messy self. If you're interested in jumping in with this study, it's not too late! 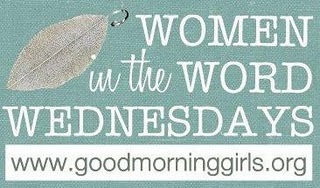 Visit www.goodmorninggirls.org and click on the Advent study. The plan and accompanying eBook are completely free when you subscribe for email notifications. 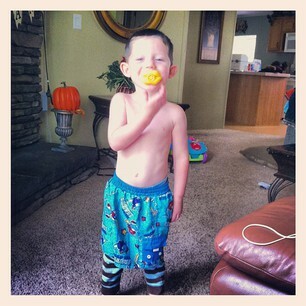 Silly boy on a Saturday morning. Nevermind the wreck of a house behind him. 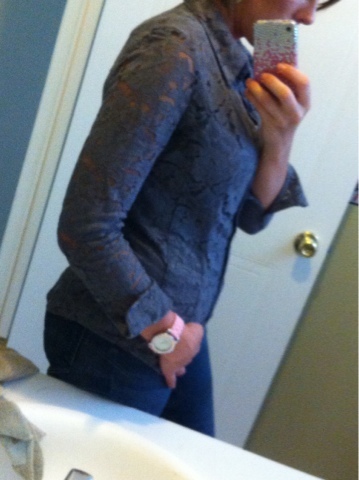 Just keep'n it real. B and Grandad stopped by for a quick visit on their drive home from Atlanta. They brought the boys real Coke. Like in a glass bottle. 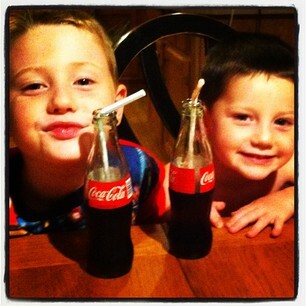 If Coke was foreign to these kids as is, having it in a glass bottle was just crazy! I've been terribly ill this week. Yesterday the only thing appetizing for lunch were pizza rolls. With a side of pretzels and a dill pickle = nonhealthy. 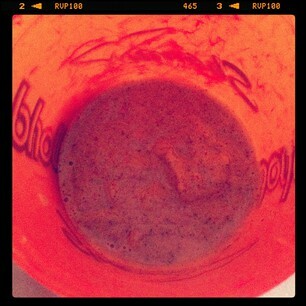 I've tried to make up for that today with better choices, including this green smoothie. 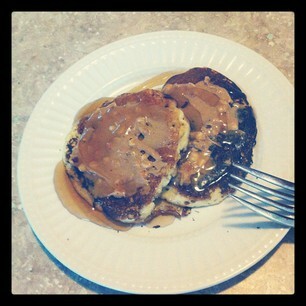 Looks like baby poo but tastes good! 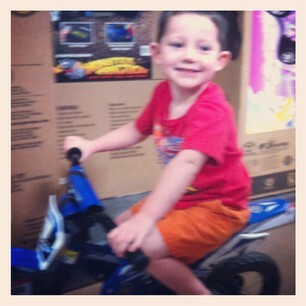 This boy conned Daddy into testing out the bikes at Wally World. What a sucker. And disregard the fact that he doesn't match. This was obviously Daddy's doing. Mess # 37.468 courtesy of Brigdon. A nearly-full bottle of baby powder that nots so very full any more. Empty actually. BUT -- my bathroom now smells baby fresh. 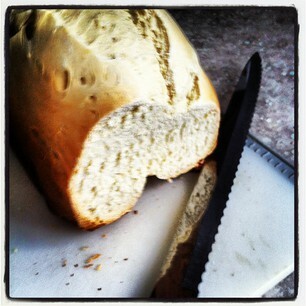 Warm Hawaiian sweet bread fresh from the machine...mmmm. We'd planned on buying this critter his very own bike for his upcoming birthday, but a friend of ours just happened to have one they no longer needed. 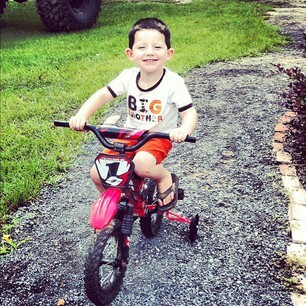 He is lovin' his new (new to him) bike! 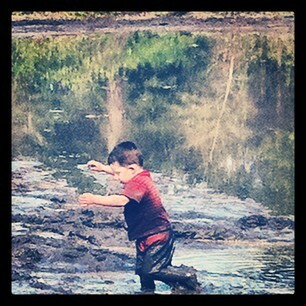 Keeps calling it his "dirt bike." Hope your week's been great! Me again...it's finally Friday, which means...InstaFriday! Linking up with Life.Rearranged. for a quick rundown of our week through the grainy lens of Instagram. 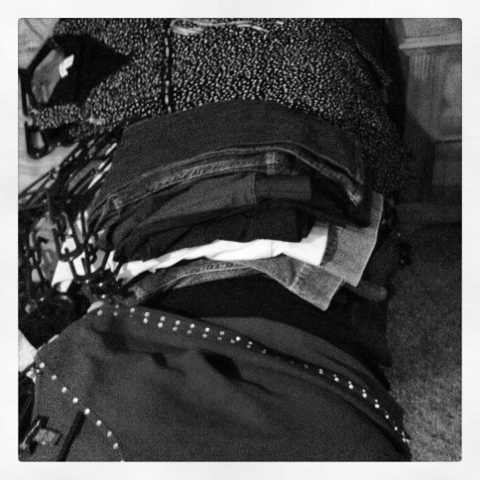 Loads of sewing this week...and more to come. 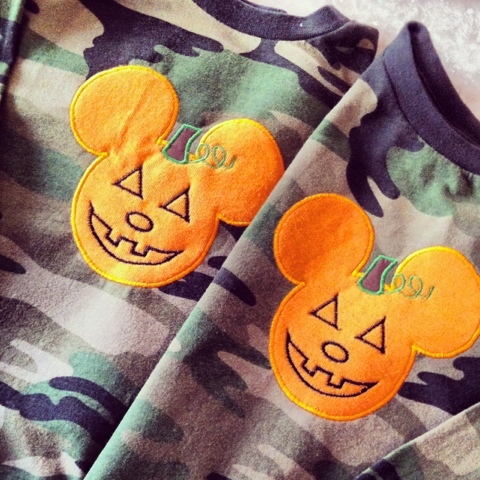 Stitched these shirts for my boys to wear for Mickey's Not-So-Scary Halloween party at Disney in a few weeks. They love hte camo! 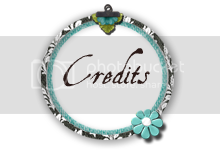 Remember that baby girl shower gift I threw together last week? Ended up going back and adding sweet ruffles to the bum. Is there anything cuter??! 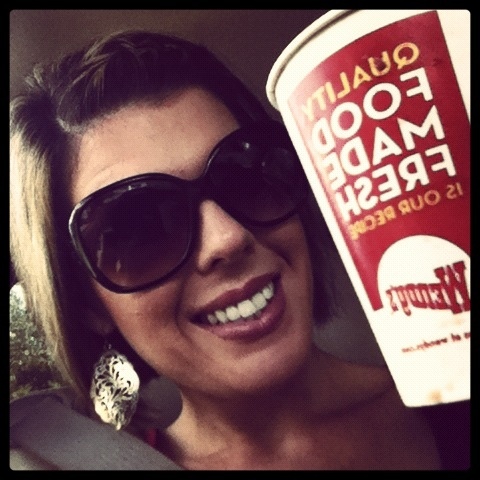 Slurping on a kiddie Frosty while waiting in the pick-up line for Harrison on early out day. The Frosty was Brig's bribe to stay away until we got home (cat nap in the car = no real nap at home = cranky boy). He was passed before we even made it to Wendy's. 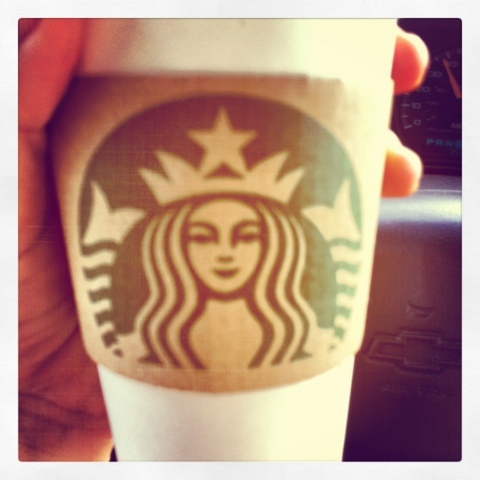 Had my first baby doctor appointment and celebrated with my first Pumpkin Spice Latte of the season -- thank goodness they don't sell these year-round. And out come the maternity clothes. At 7 weeks. Woah. That didn't take long. 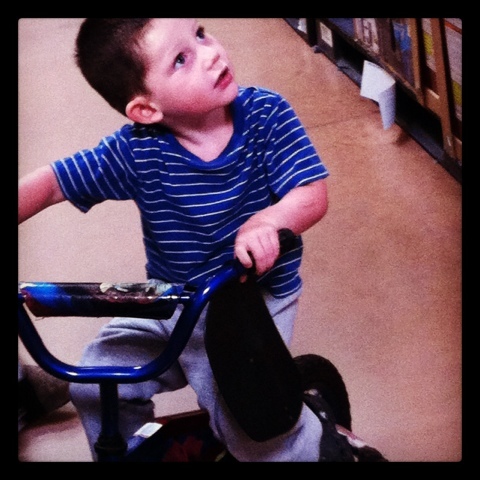 This Crazy picked out his birthday present...a Spiderman bike. Hard to believe he's almost 3! 7 weeks "bump"...except technically that's not a bump, it's bloat. Linking up with Life. Rearranged. for a brief rundown of our week through the lens of grainy Instragram pics. If you'd like to follow me, I'm @susan7610. 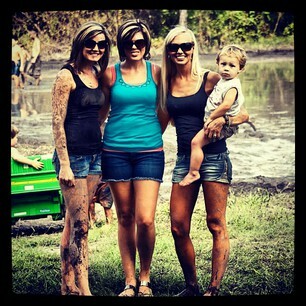 We spent Saturday grillin' and muddin' with friends. Pretty sure the kids had just as much fun as the adults. Nice job, McDonald's with the new menu, featuring calorie counts in plain view! 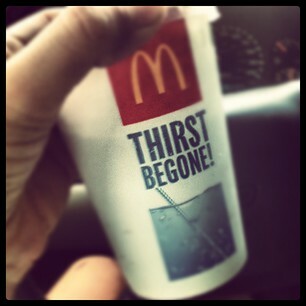 It made me think twice about iced coffee and a sausage burrito...opted for an egg mcmuffin and diet coke instead. I've been waiting for this beauty to arrive in the mail for weeks...and it finally came! 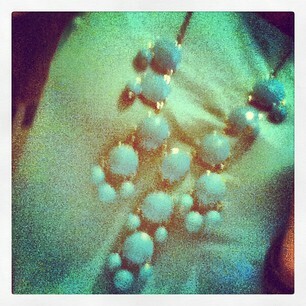 My very own bubble necklace. 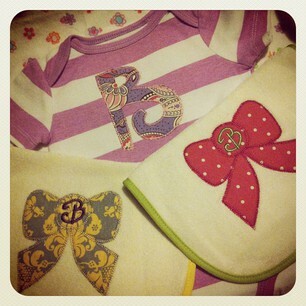 Put together a few girly things as part of a baby shower gift, and I'll be darned if it adds fuel to my baby girl fever! 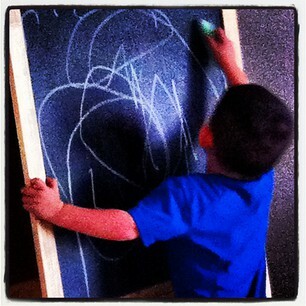 This boy loves the chalkboard (thanks, B!) -- When I asked what he was drawing, he said..."a helicopter." Right. Yes. That's 2 lines. 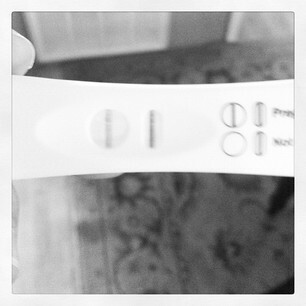 Which means our life's about to change. Welcome baby #3 -- we're so happy to have you!! Hooray for the end of the longest week ever -- it's Friday! That means InstaFriday. It's been a hairy week around here, and probably dull to most folk. 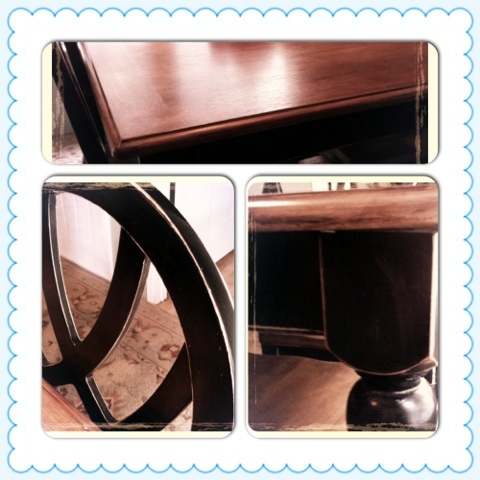 Changes and new things and cooler weather! Linking up over at Life. Rearranged. My aunt got married in a sweet sunset lakeside ceremony Saturday evening. 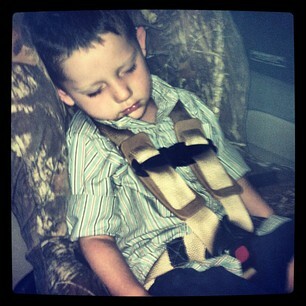 This boy enjoyed the dance floor a lil too much and crashed minutes after we left. 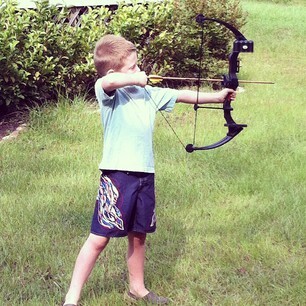 Sunday afternoon meant boy-time practing the bow. Guess it's that time of year again. And this was Daddy's method of keeping Brig out of the way during bow practice. He thinks he's "in charge" and judging each shot. Coziest seat in the house, actually. 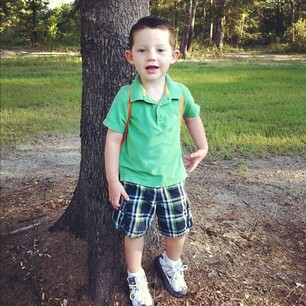 My littlest boy started preschool on Tuesday! It's just part-time at two days a week, but he loved it and his teacher said he did great. I managed to get a lot accomplished while he was gone, but that all came crashing down when he spent the hours between pickup and bedtime in a foul mood. Over-stimulated and over-tired will do it every time. I'm nearly 29 years old and just realized that wearing the next day's gym clothes to bed the night before is genius. Wake up and ready to go! It was a crisp 69 degrees this morning -- woo hoo! I knew if I put out all the fall decor, cooler weather would come. The day quickly warmed up, but we left the windows in the house open as long as we could. Well, that was until we were infested with love bugs. 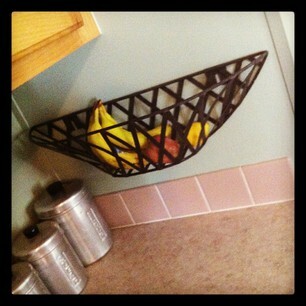 Saw this on Pinterest as a clever way to store fruit in the kitchen. Had a couple of these plantars in the shed, so I cleaned it up and got that fruit off the counter. It's so smart that I wish it was my original idea. Who am I? I am a wife, a Mama, God's child and still trying to figure out the rest. I am blessed with a wonderful husband -- truly my "better half" -- who is the lover-of-simplicity, non-detail-oriented person whom I am trying to be more like. 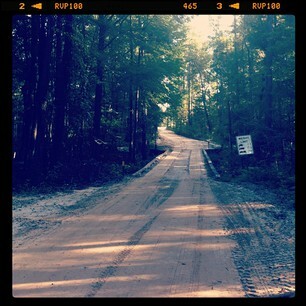 We live small-town life in the woods of North Florida and enjoy it much. 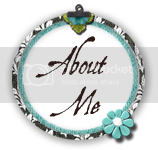 When I have time for myself (not often enough), I like to work in my yard, do crafty things, and shop. 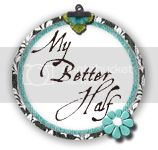 I can't think of another phrase used to describe my husband Justin than "My Better Half." He is truly just that. Aside from the values we are exactly alike in, there are an enormous amount of things that we are counter opposites. All in all, we complement each other well. If there's one thing I've learned over my years in marriage (and am still learning...work in progress), it's that it is hard and takes effort on both parts. However, the good times definitely outweigh the bad. I'm blessed beyond measure for this man who works so hard to provide for our family and be the hero that our boys deserve. 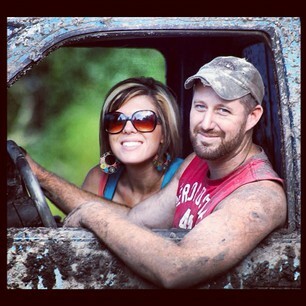 He is the down-to-earth, simple life loving person that I'm striving to be more like. I'm grateful that he loves me for me, at my best and at my worst. He makes me laugh and fills our home with joy. I, quite possibly, could go on and on like a lovesick 14-year-old. Thank you Justin for being you and loving me and adoring our children. I know they see Jesus in you and am proud to call you mine. 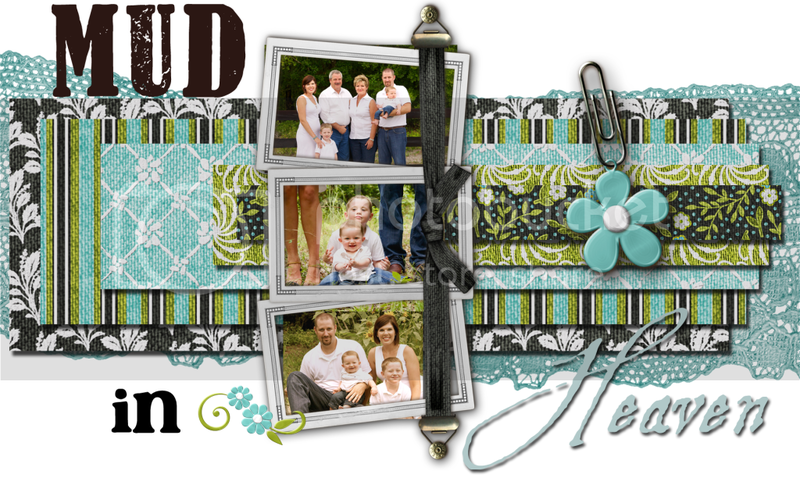 Tears come to my eyes when I think of my growing family. It took about 3.4 seconds after delivering my first child to realize that this is what God put me on the planet for. With that joy, also came the overwhelming realization of the responsibility that entails...which is still at times overwhelming! To my boys, I am beyond blessed to be called your mother. Hearing the pitter-patter of your little feet first thing in the morning makes my day. My life has been enhanced beyond measure just because of you. You are my Heart. 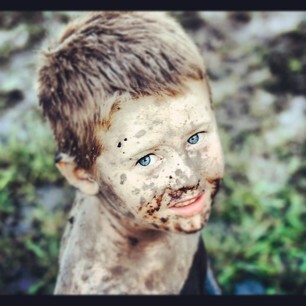 Harrison Reid is my first-born and there is no truer boyish boy! 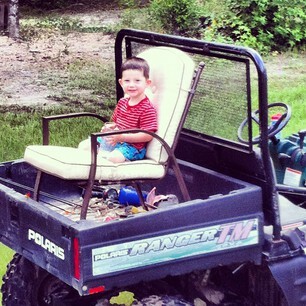 He is rowdy, rambunctious, and all things dirt and trucks and tractors. He keeps us rolling in laughter with his anecdotes and jokes and silly sayings. 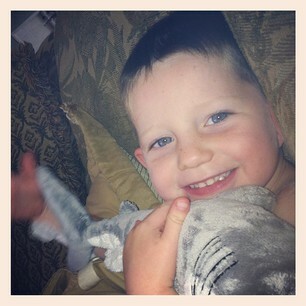 My sweet-souled boy. 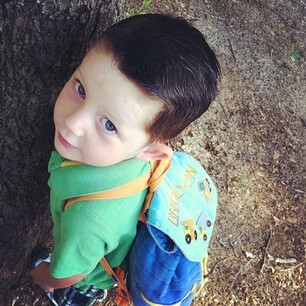 He is now a big preschooler and no doubt this little blog will fill up quickly with stories and photos about his days. I love you, Harrison, and thank you for making me a Mama. Brigdon David is (at this point) my baby and the sweetest, happiest baby - though I am a tad partial! Even at 9-months-old, he has a good little heart and that gummy smile can bring tears to my eyes. I think back to my pregnancy and how we longed for this baby to be a girl, and were surprised when we were told he was a boy. 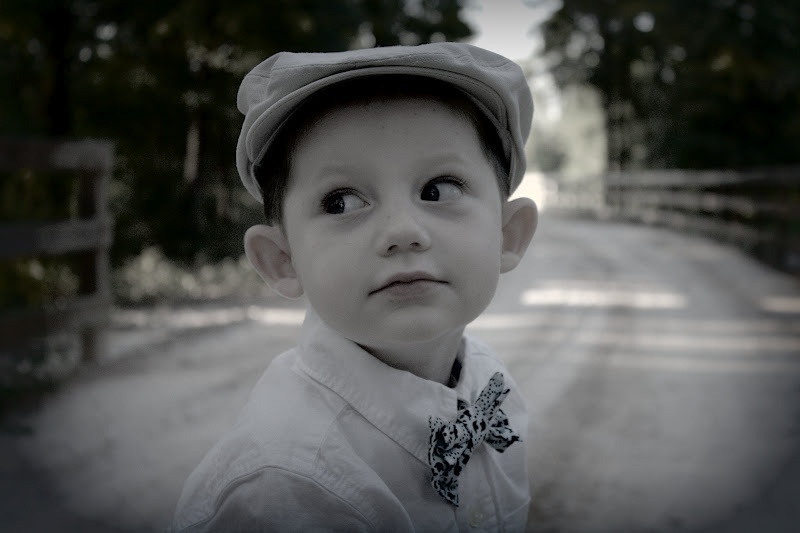 God created this child, this boy, for our family. I could not imagine our life without him. I love to watch Brigdon interact with Harrison and had no idea how blessed I would be by their love for each other - even at their young ages. Brigdon, thank you for being my baby. I can't wait to fill the pages of this blog with your little life story. God has big things in store for you.